Welcome to Stereoscopy.com - The World of 3D-Imaging, your one stop information source about the fascinating world of 3D Photography (Stereo Photography) and all other aspects of 3D ("stereoscopic") imaging. For almost 15 years, we cater for 3D-aficionados around the world and have grown to the world's largest website fully devoted to true stereoscopic images. 3D and Stereoscopy - aren't those the same? Perspective is often confused with 3D - which is not quite true, because the third dimension (Depth) is only "simulated". Therefore, 2½D would be a more appropriate expression. Stereoscopic imaging (or "real 3D"), however, requires a minimum of two pictures, simulating our two eyes. This can either be accomplished by using traditional photography (stereo photography), computers (for example Virtual Reality) or Lasers (Holography). 3D-Images can either be displayed as stereo pairs in a 3D-viewer (for slides or prints), or on a computer screen. Other formats include anaglyph pictures (requiring red-green or red-blue 3D-Glasses) and digital stereo projection (either with "passive" polarized 3D glasses or with "active" LCD Shutter glasses). Stereoscopy.com provides information about stereoscopic imaging for both amateurs and professionals. You have never tried to create 3D pictures? No problem: it's simple and we show you how to get started! You are looking for 3D equipment, literature or services? Our partners offer what you need! There is also a variety of 3D Clubs providing a cozy home for 3D enthusiasts. 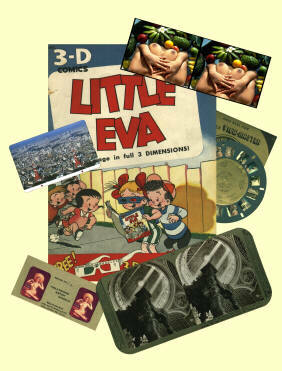 Stereoscopy.com is the place to look for information about 3D! Please come back again regularly as we are adding more exciting things all the time! We are offering a great variety of services for your information, reference and pleasure. Please have a look at the Services page. If you can't find what you are looking for, or wish to contribute some information, please let us know! Do you have any questions or comments, or are you are interested in publishing your 3D-related web pages on Stereoscopy.com? Please feel free to contact us. Copyright © 1996 - 2019 by Stereoscopy.com and Alexander Klein. All rights reserved. Any product names or logos are used for identification purposes only and may be trademarks or registered trademarks of their respective companies or institutions. Registered and unregistered trademarks used herein are the exclusive property of their respective owners. Stereoscopy.com makes no claim to any such marks, nor willingly or knowingly misused or misapplied such marks.